The flatscreen TV market is increasingly dominated by bargain-basement prices and indistinguishable gloss black designs, but is there room for a no-expense-spared purple LED TV that can (soon) make Skype phone calls? 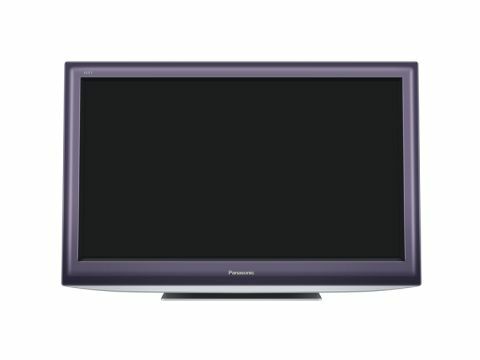 Panasonic clearly thinks there is, for this refined 32-inch LCD TV is as distinctive as it gets – not just in looks, but in its utterly comprehensive feature count. There's very little the TX-L32D28BP cannot do. Also available in silver and white, the TX-L32D28BP marks Panasonic's first ever LED TV. After yonks resisting the new technology in favour of its beloved plasma tech, the TX-L32D28BP sees the traditional 'always on' LCD backlight replaced by an Edge LED system that works by firing light across the back of the screen from all sides. It's not the only radical design change for Panasonic; the TX-L32D28BP features a hefty steel desktop stand that the screen itself slips onto. The end result of adding this 5kg stand is a TV that leans back slightly, while its subtly purple frame appears to dip away from the front; it doesn't – it's merely a clever 3D design. These are unusual ideas that suggest that the TX-L32D28BP will look most at home in a large modern kitchen or bedroom, though it's stuffed so full of features that it could survive just about anywhere – even in a small home cinema room.